Three new flat cars ready for service. Stakes are scale 4x4s inserted in the stake pockets. The end stakes would have been used on loads such as firewood which would be stacked across the width of the car. Before the 20th century and the banding of lumber piles, the side stakes would have been used to hold such loads in place. In wheat country, the portable steam engine would be used for powering the threshing machines. Now I have to come up with a way to tie that engine down to the car. While waiting for paint to dry (it seems I do more waiting than working), I decided to try putting together some of my flat car "kits." Why flat cars? In the 1890s, the railroads had about 50% of their fleets made up of flat cars. That would change toward boxcars going into the 20th century but, for now, I needed more flats. I really wanted to make up some nice loads of boilers, carriages and other neat things and, for that, I needed the flats. 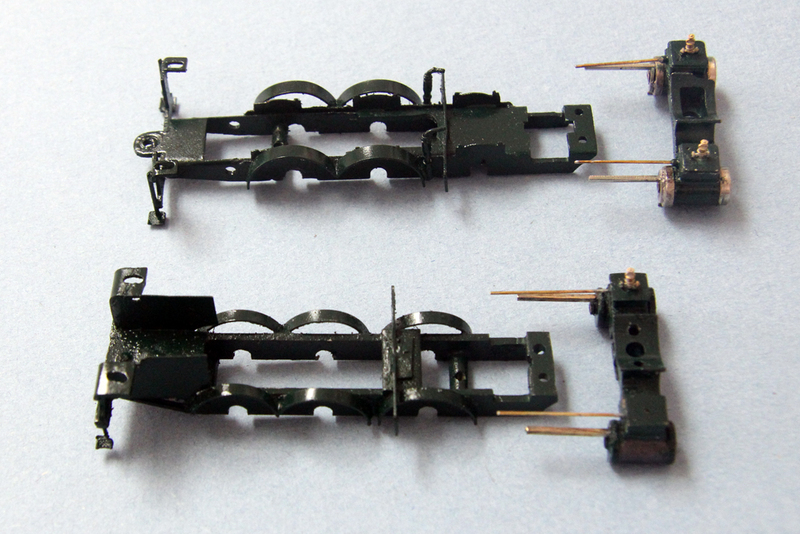 The pieces used to build these cars were laser cut for me by a friend who, obviously, has a laser cutting machine. 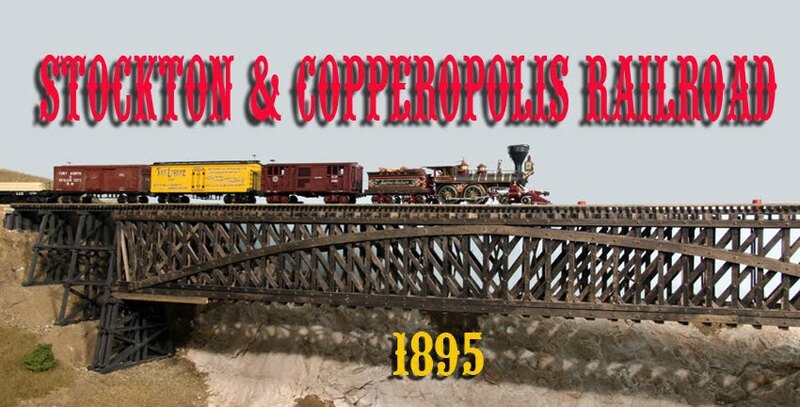 I designed the car after an 1870s era Central Pacific flat car and tried to get as much work done in the laser cut as I could. 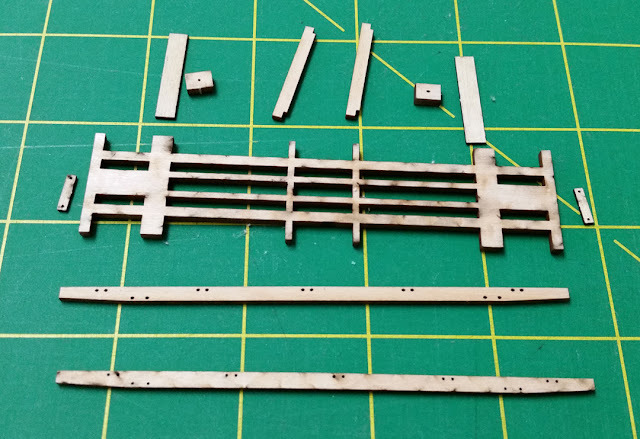 When cutting out the car, I had the holes for Grandt Line stake puts burned in the car sills as well as more holes for nut-bolt-washer castings for truss rods, etc. I did have to buy the stake pockets, NBW castings and some Tichy brake wheels and mounts for flats. The main frame of the car with its attendant pieces. Sides frames are at the bottom while bolsters and needle beams are at the top. Buffer blocks at each end. Note the holes ready to receive the Grandt Line stake pocket castings. The parts went together quickly and pretty much flawlessly using white glue. The decks were also laser cut and included the little cutouts for the stake pockets and well as the stake pockets at the deck ends (a common feature of that period). The couplers were Kadee 711 and I used some 3D printed trucks I purchased from a Shapeways seller. The trucks are of the Allen or California pattern used almost exclusively in the west and were of the swing motion variety. Reboxx wheelsets completed them. One of the things I did was make two flat cars each bearing the same number. The loads I wanted to model would those that were tied and lashed down with chain, rope and chocks and would not be easy to remove. When operating the railroad, the crews would deliver the car with its load but I wanted to be able for them to remove the empty car. The easiest way to do this would be to build two identical cars, one with the load and the other with just the remnants of the dunnage. So far, I haven't put any loads on them except for the portable boiler/engine and that isn't tied down yet. 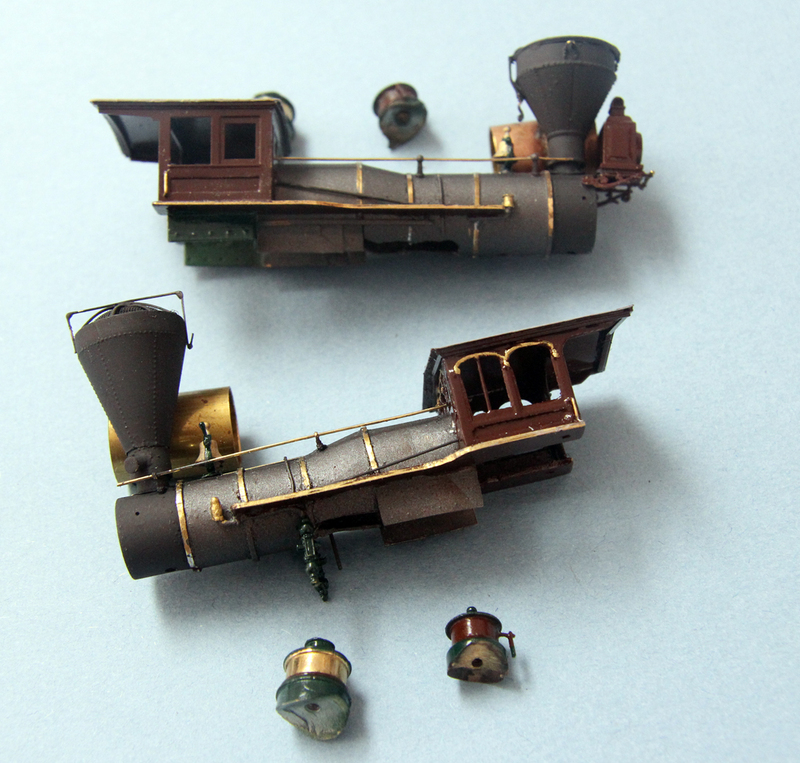 Now, back to finishing up my two locomotives. The upper locomotive is of the Virginia & Truckee Storey while the bottom is that of the Ormsby. 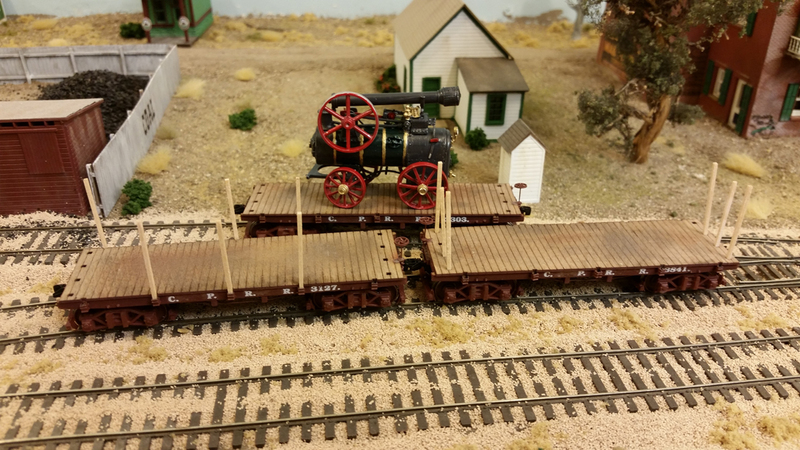 My slow-moving locomotive project is finally out of the paint shop. Following the color of the prototype (or what we think we know about the prototype), I painted the engine with a dark green chassis with the tender a two-tone brown/green. This seems to be what the few pictures of the original engine suggests. The domes and cylinders were masked and painted to give the two-tone paint job as well as the polished brass of the steam domes. Comparing the Storey's tender (bottom) to that of the Ormsby, you can see the difference between the size of the engines. Note that the Ormsby tender has the tapered collar. The tender of the Ormsby had a tapered collar while the model I was using (Porter Mogul) did not. It turned out to be relatively easy to unsolder the wire bead around the top of the collar, cut the taper and then resolder the bead. The relative size of the engines can easily be seen by the frames. The cylinders for the top frame (Storey) are from a MEW Tahoe while the bottom set are from the original Porter. The frames were the easiest (all one color). I used the Porter mogul frame for the Storey and built up the frame of the Ormsby from brass strips. You can see on the Storey where the rear driver position was filled in by a piece of 3mm material and a new driver slot cut to match the prototype. I used a cylinder set from a Model Engineering Works Tahoe (no, I did not cannibalize one of these scarce models but used an extra set) for the larger engine and the original Porter Mogul cylinders for the smaller one. 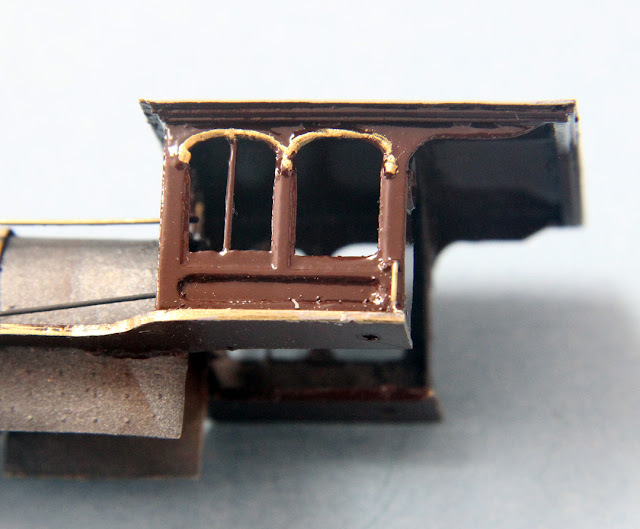 The curved molding over the windows is a separate piece which was soldered on to the window etching. The "wood" molding under the roof was built up with strips of styrene. The cab of the Ormsby appeared to be a bit more ornate than the Storey. I made parts for a new cab by etching them in thin brass and then soldered the parts together. It was a tedious process with a high scrap ratio. 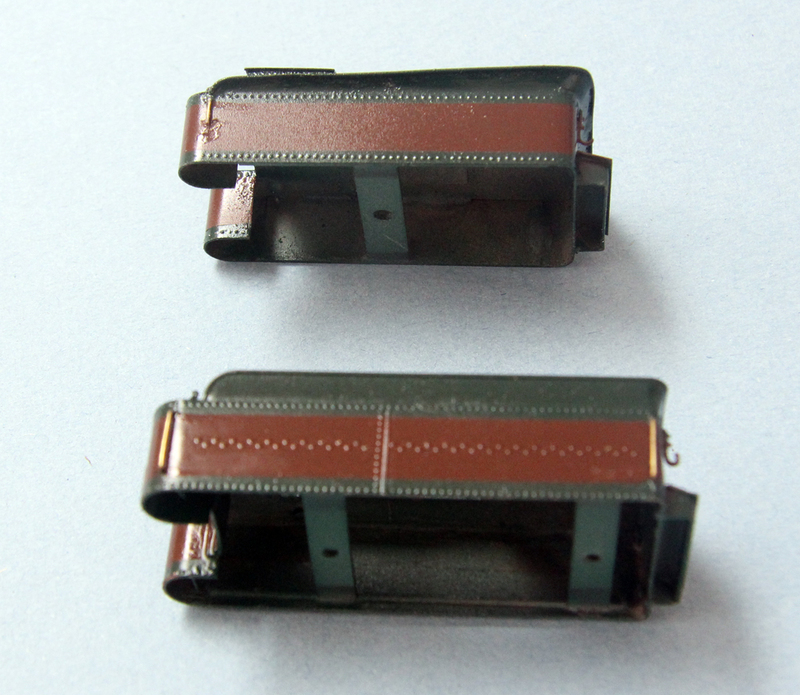 with small brass strips forming the cover. The Storey's smokestack was just a Cal-Scale ballooon stack but the stack of the Ormsby was a bit more trouble since no one makes a model of the old bonnet stacks. I took some measurements from the photos I had and then turned the stack on a lathe. 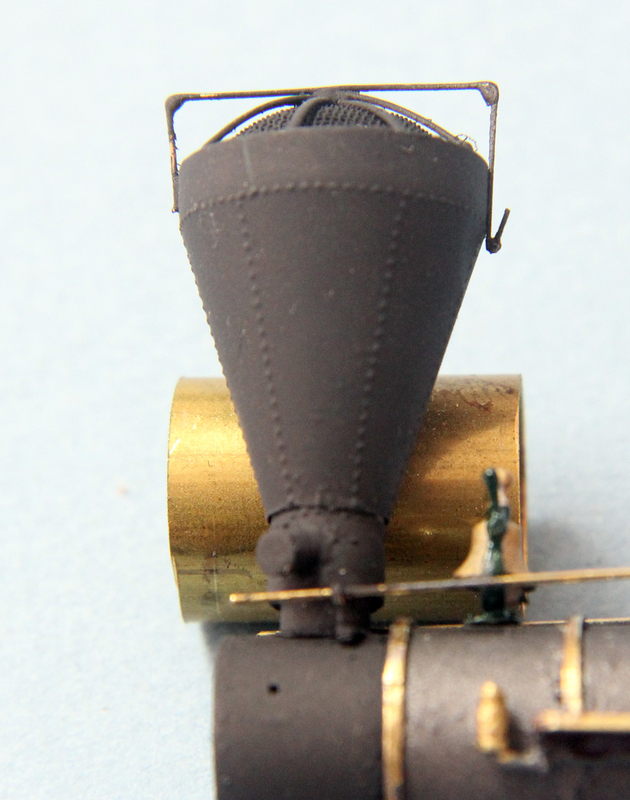 Archer rivets were added for detail. The next step is the assembly and the installation of the decoder.